Investors were desperate to enter the Chinese market in 2001, when China joined the World Trade Organization. The relatively low labor cost and the sheer size of the Chinese economy made it an attractive destination for foreign companies. These foreign companies accepted all kind of barriers to get access to China’s market. They entered into joint ventures with Chinese companies and dismissed intellectual property rights to get a piece of the world’s most attractive economy. 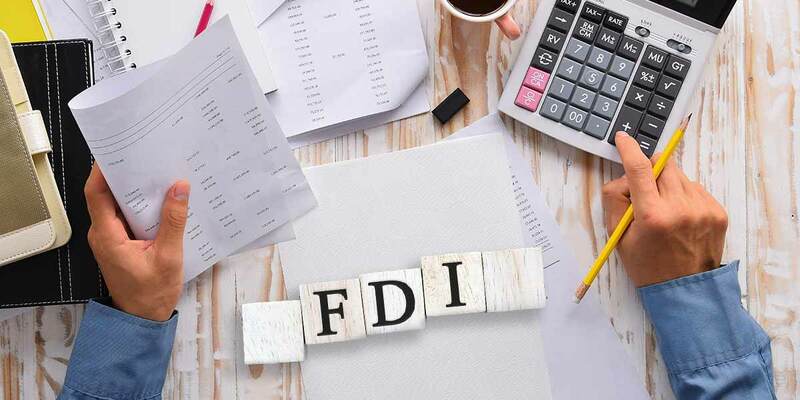 As a result, foreign direct investment doubled from 2000 to 2008, and reached a record high in 2017 in the amount of $136 billion – a rise of 7.9% as compared to 2016 – according to the Chinese Ministry of Commerce. 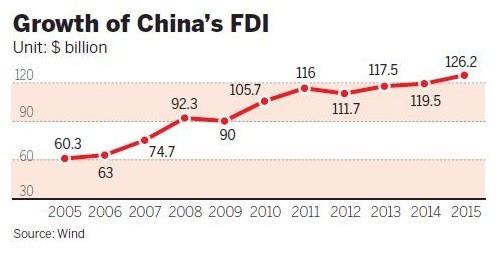 The following chart shows the growth of China’s foreign direct investments from 2005 to 2015. In the Ministry’s statement published in early 2018, more than 35 thousand companies funded by foreign capital were established in China in 2017 – 27% more as compared to the previous year. In fact, China was the world’s third largest recipient of foreign direct investment according to the 2017 World Investment Report – only behind the United States and United Kingdom, and it is also ranked as the second most attractive destination for foreign capital by the same source. As shown on the following table, the total amount of FDI inward flow reached $135 billion in 2015 but decreased to $133 billion in 2016. The number of Greenfield investments, which is a type of investment where the parent company funds and starts a facility in a foreign company from the ground up – has steadily decreased from 2014 to 2016, but the value of FDI stocks as a percentage of GDP is on the rise over the same period. In the following table, we can see the main investing countries in the Chinese market in 2016. Hong Kong takes the first place with a share of almost 69% of the total investments, followed by Singapore (5%) and South Korea (4%). Non-Asian countries such as the USA, Germany and United Kingdom take the fourth, eighth and ninth place, respectively. Due to China’s recent opening to the world and global capital flows, the country was able to achieve astounding results regarding FDI. However, since the 2008 financial crisis, a slowdown in the amount of foreign capital entering the country became apparent. Wages of Chinese workers have grown at a steady rate of 11% a year since then, making China a less attractive destination for low-cost outsourcing. Lack of transparency and shaky legal environment, combined with the government’s protectionism of local businesses, could create a major hurdle for foreign companies wishing to jump into the Chinese market. Today, some notable foreign companies in China include names such as Coca Cola, AT&T Corp, Citibank, Morgan Stanley & Co, Volkswagen AG, Unilever and many more. Some of the largest foreign investments in China have been performed by the following companies: General Motors – plant in Shanghai - $2 billion, Motorola – IT technology - $1.2 billion, General Electric – medical equipment - $1.1 billion, Arco – oil exploration in the South China Sea - $620 million, Coca Cola – beverages - $500 million. Apple is also entering the Chinese market on big doors. In addition to its mobile payment app – Apple Pay – the company has also made a $1-billion investment in the Chinese mobility provider Didi Chuxing. The fact that iPhones are more popular in China than in the United States supports the sparkling growth of Apple in the Chinese market. The US home-sharing company Airbnb has plans to triple its number of employees in China and to double its investment in the Chinese home-sharing market. The country’s market of electric cars has also seen some significant investments from foreign companies. With the number of electric vehicles sold soaring to almost one million per year, Tesla placed its largest Asian supercharger station in Beijing, and plans to add over 300 additional superchargers in China in 2017 and 2018. Ikea, the popular Swedish-based producer of furniture, is another major international player in the Chinese market. The company sees its Chinese sales increasing by more than 20% year-on-year, with plans to open new stores in China. The country’s rapid rate of urbanization adds to Ikea’s profitability and popularity. Starbucks, the US-based coffee chain, makes around 12% of its profits in the Asian market, with China having the largest share. Starbucks tailored its products to perfectly serve the Chinese customers, which in turn results in plans to grow its presence in the country. Volkswagen has also seen the potential of the Chinese market on time. The German automaker now has seven production plants in China, and makes around 30% of its global sales in the Chinese market. China has enjoyed large amounts of foreign direct investments since having joined the World Trade Organization. 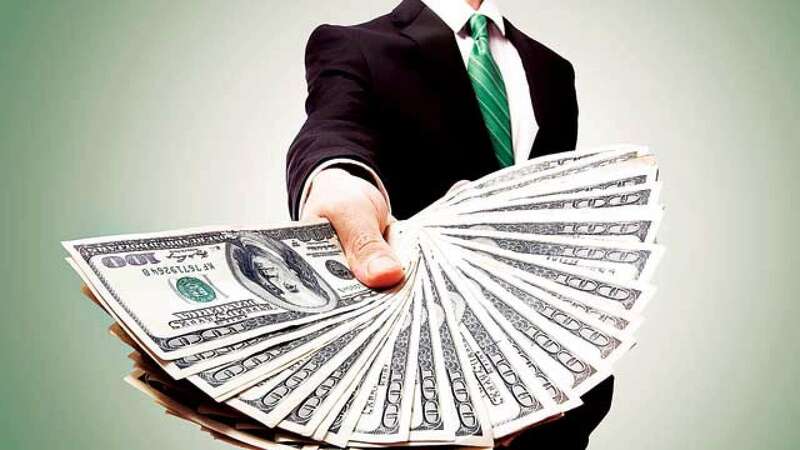 The country is still the second most attractive destination for foreign capital, only behind the USA. The importance of FDIs as a source of foreign capital is enormous for China – besides the fact the foreign companies employ around 25 million workers in China, the ambitious Chinese foreign policy (such as the Belt and Road Initiative) depend on foreign investments. The reason for this is the country’s quazi-pegged exchange rate between the Yuan and US dollar. To maintain a stable Yuan, China has to balance between inward and outward investments. In other words, the amount China can afford to spend on its foreign policy directly depends on the amount of foreign capital the country is receiving, for the Yuan to stay stable. While FDIs in China are at record-highs, the country has still to work on improving legal conditions, lowering barriers for foreign companies and reassess the protectionist approach it has toward local businesses.